An Interview with Alan Hanson, author of "Elvis '57: The Final Fifties Tours"
Discussed Research for His "Elvis '57"
EIN: What can fans expect in Elvis ’57: The Final Fifties Tours? AH: First of all, they can expect to learn a lot about a year in Elvis’s life that has definitely been under-reported. Also, the book is not just about Elvis; it’s about the whole Elvis phenomenon in 1957. There is lots of info about Elvis, of course, but there are also many anecdotes about his fans, his critics, and all the controversy surrounding him wherever he went. There’s also a special chapter on Colonel Parker, who, in my opinion, managed Elvis brilliantly in 1957. EIN: What were some of the highlights and discoveries for you in producing the book? AH: As far as discoveries are concerned, I found information that debunked some myths that surround Elvis in 1957, in particular the false reporting of riots and the gross over-estimates of crowd sizes. I’m an Elvis fan, but I’m also a historian by training, so I think historical honesty is important. The highlights of the process for me were locating and then hearing the stories of people who actually saw Elvis perform in 1957. Getting the chance to interview Gordon Stoker and Hugh Jarrett, of course, was special, and it was great to sit in Red Robinson’s office in Vancouver, B.C., and hear him talk passionately about his day with Elvis in 1957. The biggest highlight for me, however, was being able to run down and interview Bob Blackburn and Nancy Welty. Bob was a Portland DJ in 1957, and Nancy won a contest he ran on his radio program. Together they attended Elvis’s press conference and concert in Portland. I loved talking to them about their memories of that event fifty years ago. 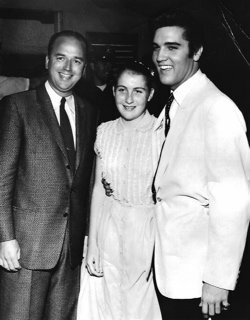 The picture they had taken with Elvis that day (below) is in my book. EIN: 1957 was a huge year for Elvis before he entered the Army. How many shows and fans did he perform before? AH: In 1957 Elvis performed 28 live stage shows in 18 cities and on one military post. It broke down like this: one show each in Chicago, St. Louis, Fort Wayne, Buffalo, Spokane, Vancouver B.C., Tacoma, Seattle, Portland, Tupelo, Oakland, and Schofield Barracks (Hawaii); two shows each in Detroit, Toronto, Ottawa, San Francisco, Los Angeles, and Honolulu; and four shows in Philadelphia. The biggest crowd he played to that year was in Vancouver, B.C., (16,500) and the smallest was in Philadelphia (3,200). The combined paid attendance for the 28 concerts was a little over 250,000. Although that represented unparalleled drawing power for those days, it didn’t satisfy Colonel Parker, who repeatedly exaggerated the crowd sizes in each city. His phony numbers are still being quoted today, but I tried to set the record straight in my book. EIN: How were Elvis’s performances in 1957? Do you think he put something extra into his live shows knowing they would be his last for several years? AH: For his 1957 concerts, Elvis had obviously matured considerably as an entertainer since the year before. All of the performances were basically the same. He was on stage for 40-45 minutes and sang 15 or 16 songs, always opening with “Heartbreak Hotel” and always closing with “Hound Dog.” By 1957 he had become a master at controlling a crowd’s emotions. He calmed them down, got them on the edges of their seats, and then made them explode in a frenzy. Then he would slow it down and start the process all over again. I think those waves of emotion he took them through is why so many people talk about being “drained” after attending a Presley show back then. EIN: What were some of Elvis’s standout concerts in 1957 and why? AH: I think three shows really stood out because of unusual things that happened during them. First, in Chicago on March 28, 13 girls fainted when a group of fans pressed up against an iron railing around the stage. It scared the hell out of Colonel Parker, who knew the death of a girl at an Elvis concert would be disastrous for his boy’s career. Parker worked very hard the rest of the year to make sure security was strong enough to keep fans from reaching the stage. 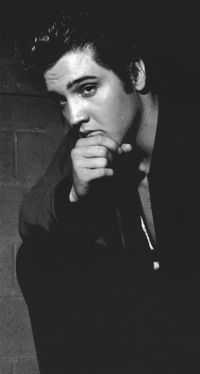 The one security lapse was in Vancouver, B.C., on August 31, when Elvis played Empire Stadium, an outdoor football arena. To get a better view, thousands of fans poured out of the stands onto the playing surface and advanced up close to the stage. The Colonel got scared and pulled the plug on the show. Elvis left after just 22 minutes on stage. The third standout show was in Los Angeles on October 28. Elvis ended the show by rolling around on stage with Nipper, the plaster RCA trademark dog that usually sat quietly on one side of the stage. The next day, a columnist for the Mirror-News accused Elvis of lewd behavior on stage. As a result, the next night the police, after warning Elvis to tone it down, filmed his performance as evidence should he violate the city’s public decency law. EIN: 1957 was also a very controversial year for Elvis. In researching Elvis ’57,what views and insight did you form about the controversy? AH: It was quite interesting, the whole controversy that surrounded Elvis and rock ’n’ roll back then. 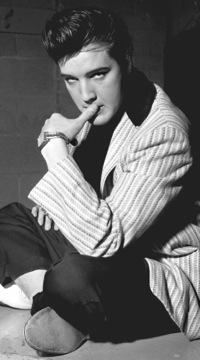 Some people, particularly religious groups, very strongly believed that Elvis needed to be stopped because they felt he was corrupting the morals of young people. There were some adult journalists, parents, and government officials who actually liked him. But the majority of adults were simply in denial. They truly believed, and I came across this sentiment quite often, that the whole Elvis thing would eventually fade away on its own. They were certain that Elvis was a fad that would soon disappear, and that he would have to go back to driving a truck. Then their children would return to the music of Frank Sinatra, Bing Crosby, Doris Day, and the newest crooner, Pat Boone. They had no idea rock ’n’ roll was there to stay. If they had, the adult backlash against Elvis would probably have been much stronger than it was at the time. EIN: Also, in 1957 Elvis performed outside the USA for the first and only time in his career. Please tell us about the Canadian shows? EIN: Why was the Montreal show cancelled? AH: Montreal didn’t directly ban Elvis from appearing in the city. Instead, the city council voted to withdraw permission for Elvis’s show to use the city’s large indoor arena. Since there was no other venue in the area large enough to accommodate the show, the promoters had to cancel it. Why the Montreal officials blocked Elvis’s appearance is not completely clear. Elvis wasn't even sure why when asked about it in an Ottawa interview. One possible reason was that there was an election approaching, and the politicians were concerned their chances for reelection would be hurt if a riot occurred during Elvis’s show in the city arena. EIN: “The Presley Special” … please tell us about that? AH: A travel agency and the Canadian National Railroad put together a package deal for Montreal citizens who wanted to go to Ottawa to see Elvis perform on April 3. Riders got rail transportation and a ticket to the 8:00 p.m. show in Ottawa. There was a band on the train so the teenagers could dance in the aisles during the two-hour trip to Ottawa. There was more dancing at the station in Ottawa as the teenagers waited to board the train for its 11:00 p.m. return trip to Montreal. EIN: Riots at Elvis concerts in 1957. How prevalent were these? AH: There were none. Period. There were no fire hoses, no rubber bullets, no paddy wagons at any Elvis concert in 1957. The only arrests I read about were four college boys who threw eggs at the stage in Philadelphia and a drunken sailor in Vancouver. Screaming and jumping around occurred at every concert, but nothing that approached a riot. Elvis was able to complete his entire show in every city except for Vancouver. What happened there could be described as pandemonium, but it was far from a riot. Ask Scotty Moore. Ask Red Robinson. They were there and they say there was no riot. The Elvis myth-makers love to think that Elvis caused riots everywhere he went. It bothers me when I read that word “riot” attached to Elvis’s concerts. It makes Elvis seem like some freak who provoked violence and vandalism, instead of the exciting performer that he actually was. EIN: What extra security precautions had to be taken for Elvis’s 1957 live shows? AH: As mentioned earlier, the mob of girls around the stage in Chicago scared the Colonel. At every Elvis show after that Parker insisted that even more security forces be on hand than were called for in the original contract with promoters. There were anywhere from 50-100 police officers on site when Elvis performed. Parker was determined that, after Chicago, fans would not be able to reach the stage. In the indoor arenas, he made sure security forces blocked every aisle and pushed kids back to their seats. The Colonel even used his own body as the last line of defense. He stood in front of the stage, and if any girl made it past the police, he rushed forward and forced them back himself. At the outdoor stadiums in the Pacific Northwest, Parker had a row of wooden sawhorses set up a short distance in front of the stage. He called the area between the barrier and the stage “No Woman’s Land,” and as far as I could discover, no woman ever made it across that area while Elvis was performing. The only big collapse in security happened in Vancouver, but even there no one crossed the barrier until after Elvis left. EIN: 1957 was also the year of Elvis’s famous “Gold Suit” designed by Nudie. What did you discover about the suit? AH: Colonel Parker paid $2,500 for the gold tuxedo that he wanted Elvis to wear for all of his 1957 stage shows. The suit included jacket, slacks, belt, tie, and shoes. However, Elvis only wore the complete suit three times. He wore it for his first two concerts of the year in Chicago and St. Louis, and then several days later he wore it for the last time during his first show in Toronto. Elvis stopped wearing the gold pants because gold was flaking off when he went down on his knees on stage during “Hound Dog” at the end of each concert. Elvis eventually abandoned the gold tie and shoes, as well, so that by the time he went to the Pacific Northwest in late August, he was only using the gold jacket and belt. EIN: Rock historians have written extensively about “Beatlemania” with the magnitude of “Presleymania” being overshadowed. What is your view on the issue? AH: If you’re referring to the pandemonium generated by Elvis and The Beatles, I think the crowds reacted with about the same intensity to both. The Beatles did draw bigger crowds. For instance, in 1957 Elvis drew 16,500 for his concert in Vancouver, B.C.’s Empire Stadium. Seven years later The Beatles appeared in the same stadium and drew a crowd of 20,500. There were a couple reasons for that. First, in the seven years between Elvis and The Beatles, the population of most major cities increased. More importantly, though, Elvis was fighting a highly conservative U.S. culture in 1957, while The Beatles rose to popularity in a much more liberal and permissive society in America. Who knows how many more teenagers would have gone to see Elvis if their parents hadn’t absolutely forbid them to do so? EIN: How potent was “Presleymania“ in 1957; was it at its peak? AH: It certainly was. There was some doubt about Elvis’s popularity when he started his first tour of the year in Chicago in late March. Pat Boone and Harry Belafonte were selling a lot of records, and many thought Elvis, who hadn’t been on stage for months, had lost his edge. The crowd in Chicago put an end to that notion. They screamed throughout the entire concert, as did the crowds at every Elvis concert that year. He drew crowd numbers in 1957 like no entertainer, including himself, ever had. EIN: The Conroy Boxing Bowl show itself is not well known but one of Elvis’s most unusual and intriguing concerts. Please tell us about it. AH: I was unable to find much information about the content of that particular show, but I assume it was much the same as the other concerts that year. The show was on Veterans Day and was primarily intended for military personnel and their families. However, the show was also open to the public, and quite a few people made the trip up from Honolulu into the hills of central Oahu, where Schofield Barracks is located. All tickets were $1, making it the cheapest ticket to see Elvis anywhere in 1957. 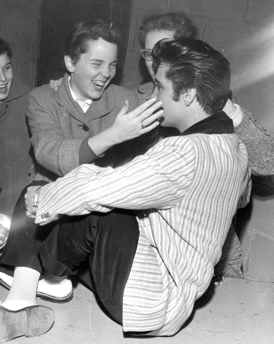 EIN: In 1957 Elvis either met or had a profound effect on emerging and future stars. In particular EIN is thinking of Ricky Nelson and Jimi Hendrix. What did you uncover about their experiences? AH: Elvis’s meeting with Ricky Nelson after his first Los Angeles concert in October has been well documented, and, although it’s discussed in Elvis ’57, I didn’t uncover anything new about it. Jimi Hendrix saw Elvis’s Seattle show from a distance. He couldn’t afford to buy a ticket, so he stood with others on what was known as “tightwad hill,” which overlooked the left field fence of Sick’s Stadium. A few days later Jimi drew a picture of Elvis in his notebook. EIN: In 1957 Elvis performed a number of songs in concert, which it appears were not recorded either live or in the studio. What can you tell us about these? AH: During my research I came across three such songs. A woman who attended Elvis’s concert in Spokane claims that he sang “Searchin’,” a Coasters hit in 1957. I didn’t report this in my book because I couldn’t confirm it. I’m also leery of a newspaper reporter’s claim that Elvis sang Charlie Gracie’s “Butterfly” in Toronto on April 2. Again, there’s no other report of this, and I’m not confident a reporter, who was not an Elvis fan to begin with, could recognize what Elvis was singing amidst all the screaming. There is no doubt, however, about Elvis singing “Fool’s Hall of Fame” in both Vancouver on August 31 and Seattle on September 1. Multiple people have testified to this, including D.J. Fontana. "Screaming and jumping around occurred at every concert, but nothing that approached a riot. Elvis was able to complete his entire show in every city except for Vancouver."